Last night after work I pulled the Ultron out to ride it around the back yard. I wanted to see how it would handle the very rough terrain. I slowly tracked around the yard and discovered despite having four coil over shocks on the front, the scooter does not absorb bumps well at all. I did back off the adjustable rear springs to at least make the back end a little softer. After I was tired of getting bounced around I took the scooter out on our road for a bit. I turned onto one of our side streets to do a max speed test. Since it was dusk, the speedometer that is not visible in direct sunlight was easy to see. The first test was full power mode but only utilizing the back 1600W motor. I squeezed the trigger hard and held on. The scooter shot up to 70kmh pretty easily and maintained it, a blistering 43mph pace, if the speedometer was accurate. 70kmh was the posted top speed on the web site and I hit that with only a single motor. Of course I had to repeat the test using both motors. When you use both motors on the full power settings it is a scary scenario. Both wheels spin and continue to spin even as you get rolling. I gunned the throttle and held on for dear life. The speedometer rolled past 70 and kept climbing. I could hardly believe when I saw a 91 on the display before I let go to slow down. 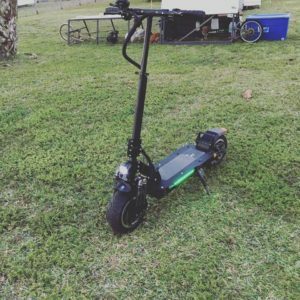 Again if accurate, that means this scooter is capable of hitting 50mph for short distances. I still find these numbers hard to believe so I plan on doing additional speed testing using GPS and other timing devices. If that speed proves to be accurate, it’s pretty crazy. Yesterday I was looking into various options regarding rehoming the one young bird that we are 99% sure is a rooster, aka. Danielle. As I did I stumbled across just how many roosters are being given away, or at least attempted to be given away. As I researched I came across a site that advocated keeping roosters and how owning one is not necessarily a negative experience. To me the negatives are we don’t want any more baby chicks, crowing and the potential aggression a rooster can have. The first issue can be simply addressed by grabbing eggs daily so they never get sat on by hens to hatch. Crowing, if it’s only occasionally isn’t terrible as the hens themselves are extremely noisy when laying eggs as well. Aggression in some situations can be an advantage as a rooster will instinctively try to protect the hens from predators. The major thing is not letting the bird establish dominance over you. We have a hose in the chicken yard at all times which would be a pretty effective deterrent if Danielle (guess he needs a new name), would turn his aggression on us. There are plenty of examples of roosters being quite fond of humans too. So anyway, Cindy and I agreed we will both give it a shot and see how it goes. Danielle should feel like a very lucky bird.